Cut video clips by setting start point and end point easily. 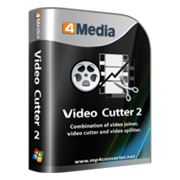 Multiple input and output video formats are available with 4Media video cutter. Immediate preview on original videos and video clips when edit videos. More adjustable parameters on video and audio effect to create stylish video editing. Support Various Input and Output Video Formats .